A: [There] was a record number of women running for congressional seats this year alone, and currently the seat I’m running for there’s a woman in the seat. I want to make sure it stays a Democratic woman. Sure, I think it’s doable. I think it’s going to be up to us as women to make sure we’re promoting that, to make sure we’re supporting organizations that help train women to run for office—that we’re out there actively helping them to raise money and to build up some staff. I am committed to training young folks to learn how to work on campaigns, working to build that base. You need a support system when you take on a campaign, especially one like this. It’s very intense. Q: What advice do you have for young women interested in running for office? A: What I’d like to see ahead of anyone running for office is that we get people, young women, who will volunteer on campaigns, apply for internships on campaigns and be a part of the campaign life so that they know and understand how campaigns work and so they can learn how to do different jobs in a campaign. I feel like that has helped me more than anything. I’ve been working on campaigns for a long, long time—over 15 years—and I feel like all the experience I’ve had helping other candidates has prepared me for the job I’m doing now: to run for Congress. Q: Have you faced/are you currently facing any specific challenges as a woman running for office? A: I won my primary, so I’m in a different sort of phase right now than when I first started running for Congress. I had five opponents: one woman opponent and four male opponents in this primary election. When I first started, there were people saying that I couldn’t raise the money and they were skeptical about how I would do. We essentially proved everyone wrong because we raised enough money and I won my election with 40 percent of the vote with that many candidates in the race. I feel happy and grateful for all the help we received. I’m not facing any extraordinary challenges right now; it’s always a challenge to have to raise enough money, it’s always a challenge to get enough volunteers. That’s the nature of campaigns. Q: How does it feel to have the potential to be the first Native American Congresswoman? A: I definitely feel confident about my ability to realize and understand why it is there hasn’t been a Native American woman in Congress up until now and why it would be incumbent upon me to ensure tribal leaders have a seat at the table when issues of importance come up. Above all I am not saying I can represent my tribe or any tribe in the country. However, I do have a perspective that hasn’t been heard. Congress has never heard a voice like mine. I was raised in a military family, in a Pueblo Indian family. What I can do is bring my background and my perspective as a single mom, as having lived through many struggles to get where I am today and my work ethic and all of those things I was taught by my parents and my grandparents. I think people will be able to identify with me. Q: Will your platform in Congress be largely focused on helping Native American communities, like you did in 2005 with the bill that reformed New Mexico’s in-state tuition laws regarding Native American tribes? A: My platform right now is focused on the environment, combatting climate change and moving New Mexico towards 100 percent renewable energy. It’s focused on making sure every New Mexican and every American has healthcare they can rely on. Those are all issues that affect Indian communities as well. My platform will be one that will essentially benefit everybody, not just Native Americans. However, the same issues that a lot of New Mexicans face, Indian tribes face as well, so that is first and foremost. What I can bring with respect to Indian tribes is that I know and understand what the trust responsibility is of the U.S. government towards Indian tribes. I can hopefully help to educate some folks on what that is and why it is that we should be making decisions based on that. The trust responsibility to tribes is something that every single elected official in Washington, D.C. should know and understand. I will always work hard on that, and I will make sure that I am on the side of tribes when it comes to that trust responsibility. Q: What was it like to pass a ban on conversion therapy of LGBTQ people in New Mexico? A: I was Chairwoman (of the New Mexico Democratic Party) at the time. The leading LGBTQ organization—Equality New Mexico—pushed that bill forward, and I gladly spoke up on their behalf. I did what I could as chairwoman of the [Democratic] Party to make sure that all legislators would vote “yes” on the bill. It always feels good when you can work hard to influence legislation like that, that has a resonating effect to so many people. Conversion therapy is wrong. Flat and simple. It doesn’t help anyone, it harms people, and we should always be on the side of protecting people’s human and civil rights. That’s what the passage was really all about. Q: How has your past involvement in politics—you’ve been involved with many Democratic organizations—prepared you to run for office? A: I started out as a phone volunteer, walking into campaign offices and making phone calls, like a lot of folks have. Eventually, I ended up getting a couple of paid positions on campaigns. In 2008 I was a volunteer for President Obama’s first campaign. Then in 2012 I was a paid staffer as the state Native American Vote director, which is a statewide position. I worked very hard to get every single Native American community to register and vote. Those experiences, working with people, building my network across the state and finding folks who support me individually, are important. Right now, my core campaign staff consists of people I’ve been working with for years on many campaigns. We’ve all worked together to make New Mexico a better place. All those experiences have helped me tremendously. Additionally, I was a graduate of Emerge New Mexico, a Democratic women’s political leadership training program. The national organization is called Emerge America. That gave me the nuts and bolts of every facet of running a campaign. They taught me how to do public speaking, how to fundraise, how to canvas, all of these tools that you learn about how a campaign runs. That was also extremely helpful to me. And everywhere along the way, of course, you need to build a network of people who know you, who trust you and who know how hard you work. Those are all things that will benefit anyone looking to run for office. Q: You were instrumental in flipping your State House from red to blue, helping Clinton gain an 8-point lead over Trump. How did you do this? A: I was State Chairwoman at the time, of course. When I first got into office in 2015 we had this $80,000 debt for the Party that had built up over seven years. We had lost the State House in 2014. Morale was somewhat low across the state. My Vice-Chair and I, and the other members of the Party, got in our cars and drove all over New Mexico visiting various counties and small towns. We really worked hard to register voters, to get morale up and to ensure that people knew how grateful we were for the work they had been doing. It was all about building relationships in communities and communicating with people. That’s how we started out in 2015. By the time the election came around we had raised money and we had some money to spend to make sure the county Parties were able to activate some volunteers. We went to some fundraisers for the county parties. We just helped wherever we could to make sure people were getting out and being activated. The other piece was messaging. When President Trump was candidate Trump, we felt strongly that he did not speak for New Mexicans, and that’s what we messaged on. We also messaged on our Democratic candidates across the state, and how we were the ones that knew New Mexico, how we were going to work hard to ensure that we did what our state needed. We held many press conferences, we sent many press releases ensuring that everybody knew where the Democratic Party of New Mexico and our candidates stood on the issues. We were grateful that the candidates themselves allowed us to be partners in their success as well. Q: What was your experience like at Standing Rock? 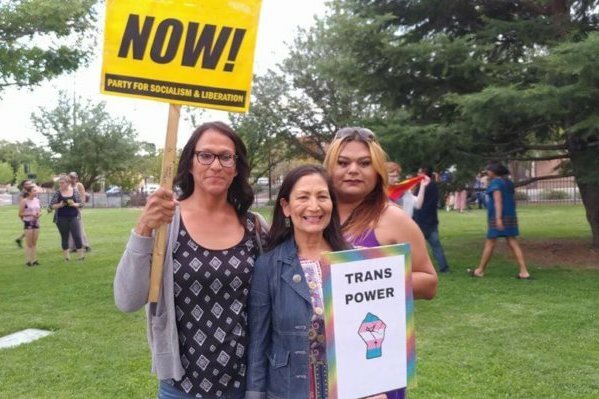 Why do you think it’s an important movement? A: After months of me messaging on Facebook and echoing the comments and the experiences of what people were experiencing there, it was important for me to go and to actually be a part of it. I was honored that the tribal administration allowed me to help them garner some support—that’s what they were mostly doing. I actually worked at the tribal building for several days. I was able to take some green chili from New Mexico! I cooked a big pot of traditional green chili stew at the Chairman’s camp, and shared New Mexican food with some folks there. I was grateful for that opportunity. To me it signified a grassroots environmental movement: We needed to pay attention to the fossil fuel industry and how it’s wrecking pristine areas of our country. I was proud to be a part of that. For environmentalists, it was a historical event that we should’ve all worked to help. Q: Can you explain your involvement, and the significance of that involvement, in the Laguna Development Corporation Board of Directors? A: It was a position I was appointed to by my tribe. With the Board position you’re just overseeing the corporation’s business. You’re not there to micromanage, you’re just there to put forth your ideas and help guide the corporation in the right direction. In the time I was there, we did some fun stuff. We got the ball rolling for “Laguna Burger,” hamburger joint that’s won the state fair competition a couple times, and it’s been a successful business model. Those are the kind of things you work on to ensure that economic development is progressing. In the end, any business that is in New Mexico will employ people, give them experience and the opportunity to rise through the ranks to make sure they have health care, fair wages and various other things. I was happy to be a part of that. Q: What’s it like running against another female candidate? A: It all boils down to our values and our agendas. I have an agenda I believe resonates with a majority of District 1 voters. I want renewable energy here in New Mexico. I want everyone to have healthcare. And I’m definitely against President Trump’s policy of separating families at the border. It’s horrible, it’s in humane and it needs to stop. That’s where I differ with my opponent. Regardless of who you run against, you should be true to your values and never give an inch, because these are the things that are going to carry us through. I will do everything I can to make sure New Mexico is in a good place. I want to make sure that people have opportunities for success through creating jobs, making sure our kids have quality public education, all of those things. I think that regardless of who’s running, be it male or female, it’s our agenda and our values in the end that will resonate with the voters. Q: When and how did your passion for political activism begin? A: I just started by walking into campaign offices of candidates I liked and making phone calls. I felt strongly that as a Native American woman in a place like New Mexico that Native Americans have a lot of power over who’s in office. We’re 10.5 percent of the population. If we all got out to vote, if we all made a stand in a statewide race, we could sway an election. That’s where I started. I am very fortunate to live in a state that values the relationship that tribes have with our state and local governments. We are partners on so many things. Indian tribes are responsible for much of our economic development here, people come here because of the culture, so I felt very strongly that if we all voted we would be able to make some inroads in making sure that good people got elected. That’s where that started. Personal values, ideals and convictions should always serve as the guiding force in life. 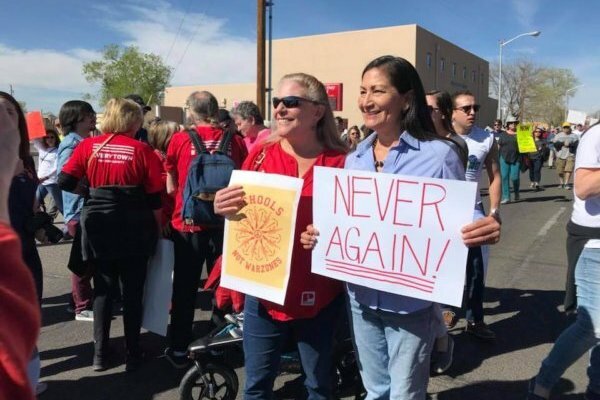 “No matter who you are running against, you should be true to your values and never give an inch, because these are the things that are going to carry us through,” Haaland said. Rome wasn’t built in a day, and you can’t expect a successful career to just fall at your feet. Haaland began her journey in political activism by simply volunteering for causes she felt passionate about. Start small, establish a strong base and build on it as much as you can.